Over the last few years, I’ve enjoyed playing with slipped stitches to create faux-stranded knitting patterns that are simpler to work—and this was my goal, again, with Torbellino and its companion piece, Dust Devil. 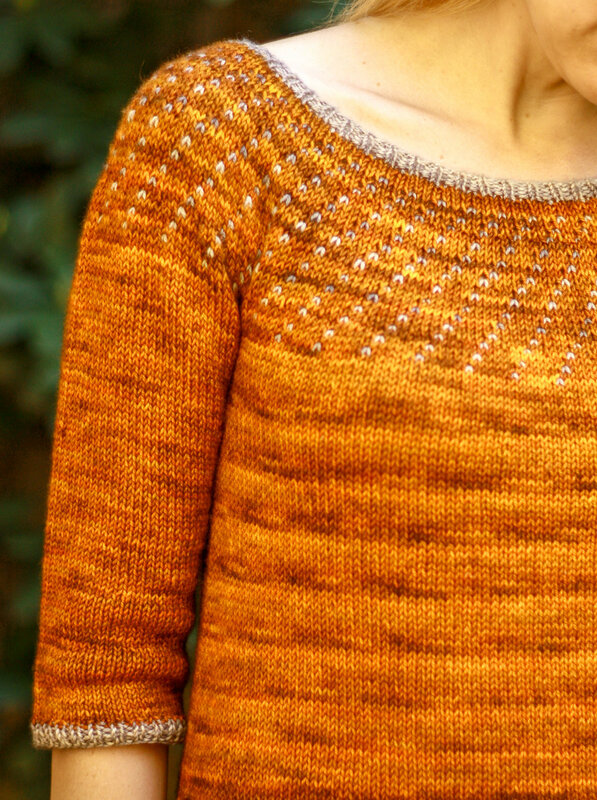 The spiraling design on the yoke is created with slipped stitches, which creates a thinner fabric than traditional stranded knitting because you’re only carrying a single strand of yarn behind your work—perfect for warmer weather! To accompany this simpler colorwork yoke, I opted for a casual, relaxed fitting body—wide scoop neck, no waist shaping, an ever-so-slightly cropped fit with short rows used to lower the back hem, and loose, elbow-length sleeves, all finished off with simple contrast trim. It’s the most comfortable sweater I’ve ever designed or worn! Yarn: Neighborhood Fiber Co. Cobblestone DK, 75% Bluefaced Leicester wool, 15% cashmere, 10% silk, 275 yd/100 g (m/oz): 3 (4, 4, 5, 5, 6) skeins in Lincoln Park and 1 skein in Federal Hill.